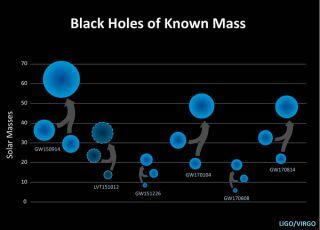 This graphic shows the masses of the black holes involved in the five mergers detected by the LIGO collaboration, as of Nov. 17, 2017. There's a population of monsters lurking in the dark depths of space that astronomers are trying to get acquainted with. These monsters are pairs of black holes, each with masses of anywhere from about five to several tens of times that of the sun, that are crashing into each other and forming even more massive black holes in the process. This week, scientists with the Laser Interferometer Gravitational-Wave Observatory (LIGO) announced that earlier this summer they had detected a gravitational wave signal from yet another one of these black hole mergers — their fifth since 2015 and involving some of the lightest black holes LIGO has ever detected. "We're getting to know black holes in a really new and unprecedented way," Eve Chase, a doctoral student at Northwestern University and a member of the LIGO collaboration, told Space.com. LIGO was designed to detect gravitational waves, or ripples in space itself. Albert Einstein showed that very massive objects, like stars and planets, curve space like a bowling ball on a mattress. (He also showed that time is fundamentally linked to space, so he called the universal fabric space-time.) Gravitational waves are created when massive objects move rapidly through space-time. On Sept. 14, 2015, LIGO made the first-ever direct detection of gravitational waves, more than 100 years after Einstein first predicted them. (The detection was announced in February 2016.) The space-time ripples were coming from two black holes that had been orbiting each other, growing gradually closer and closer together until they finally collided. All five of the black-hole merger events detected by LIGO have involved so-called stellar-mass black holes, which have masses of between about five and 100 times that of Earth's sun. "We have five different little families of black holes that each have their own quirks," Chase said. "Each detection's a little different. Some are very loud, some are very far way, some have lighter masses, some have black holes that have close to equal masses." Before LIGO's 2015 detection, researchers could indirectly observe stellar-mass black holes by looking for light coming from a star or a ring of material orbiting around the black hole. Stellar-mass black holes detected via X-rays typically topped out around 10 to 20 solar masses, but some of the black holes detected by LIGO have been much larger (which came as a bit of a surprise to scientists). This graphic shows black holes and neutron stars that have been detected using both gravitational waves and light, organized by their mass. The black holes detected by LIGO are in blue, and are mostly heavier than the stellar mass black holes detected via light. But, the June 8, 2017 detection by LIGO found black holes with masses closer to those detected using light. But this week, LIGO announced that on June 8, the instruments detected a black hole merger involving some of the lightest black holes that the observatory has yet detected, at seven and 12 times the mass of the sun. The merger created a black hole 18 times the mass of the sun, with some mass lost in the merger, and there's a high probability this is the lightest combined-mass black hole detected by LIGO, according to Chase. The merger detected by the collaboration on Dec. 26, 2015 involved black holes with very similar masses. "The kicker with this event is the mass," Chase, who was a leader on the analysis of the June 8 event, told Space.com. "The June 8 event has masses consistent with black holes previously detected through X-ray observations, allowing us to compare black holes detected through X-ray observations with black holes from gravitational-wave detections. This establishes a link between two separate populations of black holes." LIGO is discovering black holes rapidly, and will soon have found as many as were known from light-based observations before the collaboration's first detections, Chase said. LIGO also has a companion in this search: In August, the Virgo Gravitational Wave Observatory came online in Italy, and the two observatories made two joint signal detections that month — a black hole merger on August 14, and the first-ever detection of a binary neutron star merger on August 17. "We're just in the beginning stages of starting to have a population of these binary black holes," Chase said. "These binary star systems can either be formed alone or in the Times Square of stellar environments, in dense clusters bustling with stars," Chase wrote in an email. "The stars born in dense environments get knocked around much more than stars formed in isolation, leaving lasting effects on the orbit and spins of the systems. After a hundred or so binary black hole detections by LIGO and Virgo, it may be possible to determine the ratio of black holes formed in isolation to those formed in crowded environments." LIGO scientists are now like zoologists studying a rare species in the wild — their task is to try to discern between the characteristics of the individuals and those of the entire population. "We can't draw any conclusions with just five events, but we're on our way to be able to explore how binary black holes are formed," she added. But Chase said astronomers will use the detections made so far to try to estimate how many of these binary solar-mass black holes are lurking in galaxies. Every new detection will help to refine those estimates. LIGO is undergoing another upgrade that will improve its sensitivity, increasing the volume of sky over which it can search for gravitational waves. It will begin observations in the fall of 2018.